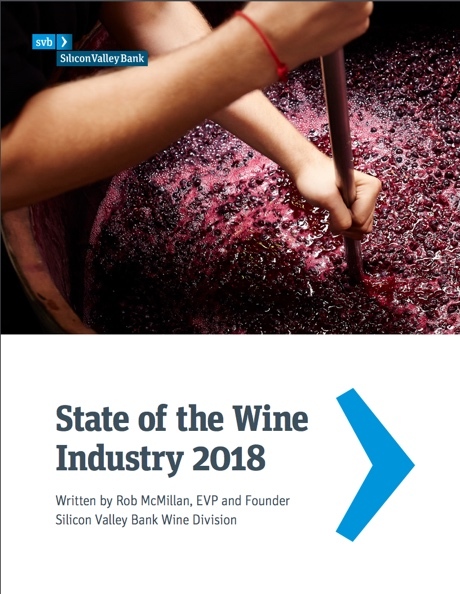 There are some words of warning in the latest review of the US wine industry by the Silicon Valley Bank. The largest growth period in the industry's history might be coming to an end. Since 1994, the industry has experienced long-term trends of increasing volumes and higher prices, with only minor flattening periods during recessions. Today, the SCB report says, consumers are leaving the lower price segments in favor of better-quality offerings, but after more than 20 years of straight-line growth trends, total volume growth is leveling out. "Premiumization is still the dominant trend, so volume drops in lower-priced generics are part of the explanation for flattening volume; but in a more recent development, even premium wine growth is slowing. 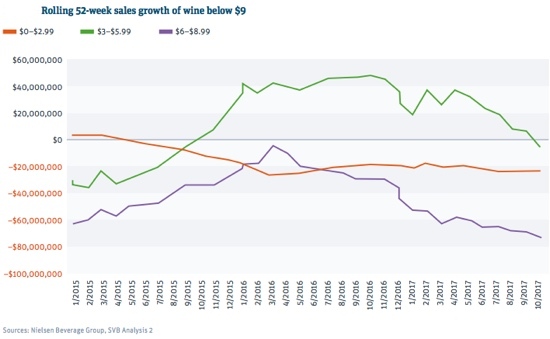 Winery owners, who have seen grape prices escalate markedly over the past five years, are finding that cost increases are difficult to pass on to new consumers, who are signaling that they have a lower indulgence ceiling than have prior generations. While the economy overall, as of this writing, is demonstrating the best results since the 2007–2009 recession, the economic circumstances that set the stage for the industry’s 20-year growth trajectory cannot be repeated. The factors that made you successful to this point will not enable you to sustain that success. This means the winning sales strategies you are leveraging in the operating environment today will slowly prove fallible tomorrow. experience — and the wine — to consumers where they live." The report notes that the break point between growth and decline in sales falls at around $9, and in 2017 the segment below $9 declined in both dollars and case volume. The only countervailing dynamic of the trend, it says, has been a short-lived improvement in $3 to $6 wines,"but even that miniscule bright spot is not what it seems. It really is reflective of larger-format box wine." In the $3 to $6 wines all the formats are converted to 750-milliliter bottle equivalents and $14+ box wine is a growth segment.